P.S. Don’t forget . . .
By the way, you can get your own copy of the ebook for free when you join my mailing list! Many years ago, I lost several crucial minutes of my memory, and in that time I almost died. There’s a funny thing about having your memories stolen from you — it makes you wonder how those memories, if you had them back, might change who you are. As I sat down to write The Spider Thief, I knew that I wanted to have the main character piece together the mystery behind his own amnesia. But then something weird happened. A few miles from my home, a man lost much more than a few minutes of memory. He lost two whole weeks. It’s World Book Day–Get a Free E-Book! It takes a lot to make a guy like me blush. In celebration of World Book Day and Read an E-Book Week, the ever-awesome Booktrack.com has named me a Booktrack Star. Click the cover image and sign up for a free ebook! 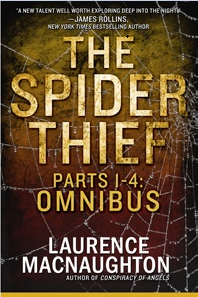 I’m publishing each part of my new thriller, The Spider Thief, separately in quick, fun-size episodes. Part One: Stolen Memory is about to hit Amazon. But just for fun, I leaked a sneak preview online. A hundred reads in the first 24 hours. I’m honestly humbled at the great response. And I can’t wait for you to see all the twists I’ve packed into each episode. I’ll give you some hints: An ancient curse. A lost city. A family secret. A million dollars in cash … and that’s just the beginning. Get your free ebook — but hurry! To celebrate the upcoming release, I’m going to give away a free copy of Part One: Stolen Memory to the first 100 people who join my newsletter list. Want your copy? Just click here to subscribe. Want to share your thoughts about The Spider Thief? Leave me a comment.